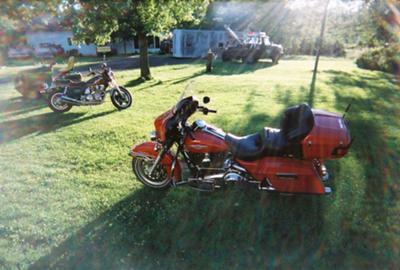 I have the 2008 Harley Davidson Tour Glide for Sale that you see in the picture. The 2008 FLTC Ultra Shrine has the Screaming eagle exhaust and the Touring package. If you're interested you can reach me by leaving your questions and contact information in the space below provided by Strike Lightning Motorcycle Classifieds and I will get back to you with answers to your questions as soon as possible. The mileage of the used Harley Davidson motorcycle for sale is currently reading 7,500 and the paint color is Firemans Red. This is a nice motorcycle that has been carefully ridden, owned and maintained by one original owner. The 2008 Harley Tour Glide for sale is located in Ottumwa,Iowa and my asking price is $16,500. Strike Lightning would also encourage bikers to submit a review of the 2008 Harley Davidson Tour Glide for Saleto help potential buyers make informed decisions and to benefit the biker community as a whole.